Camp of a native chieftain. bl.uk > Online Gallery Home	> Online exhibitions	> Asia, Pacific and Africa Collections	> Camp of a native chieftain. 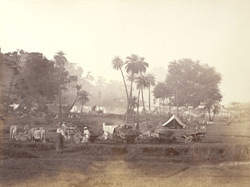 Photograph of a travellers' camp with bullock carts from an album of 80 albumen prints taken in North India by Eugene Clutterbuck Impey. General view of a camp on open ground, with woods beyond. In the words of James Fergusson accompanying the photograph: 'Under the large tree to the right are the chiefs' own tents, with variegated borders, and running walls of canvas enclose his private tents and those of his harem.' There is no information on the identity of the chieftain whose camp it is or of its location.